Whether you are stopping by to get fuel and supplies or are looking for a place to stop for a while, Atlantic Yacht Basin’s dockmaster team is here to serve you. Our dockmasters are courteous and quick to help you with whatever needs you may have during your time at AYB. 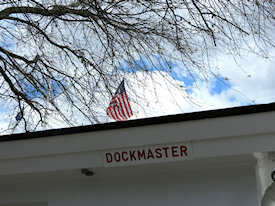 Rain or shine, on-season and off, night or day, our dockmasters are known on the Waterway for getting the job done. In addition to fuel ups, regular check-ins and check-outs, and other routine services, our dockmasters can handle other after hours and weekend special requests for customers from other parts of the Yard with advance notice. They also have a lot of great information and can help you with locating local services and attractions, including, but not limited to transportation, accommodations, shopping, and medical services. Please text or call our dockmasters at (757) 615-7585 or email us at dockmaster@atlanticyachtbasin.com when you are on your way. Thanks for the work the yard did on our bottom paint and thruhull valves – very professionally and efficiently. We’ll see you next year!